Kenpo is a unique and versatile martial art – a self-defense system that utilizes traditional and modern training methods. The Kenpo practitioner uses the rounded fluid motions of Chinese martial arts and the hard linear strikes of Japanese Karate to create self-defense techniques, form exercises and free-fighting combinations. 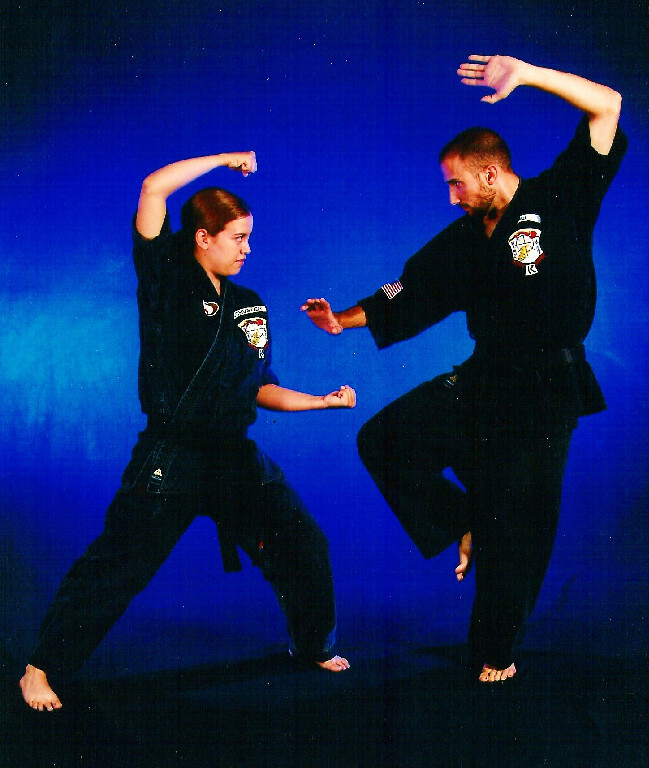 Based on four basic principles of physics: torque, back-up mass, borrowed force, and marriage of gravity, Kenpo allows even the smallest person to achieve maximum effectiveness by employing proper body mechanics. My first exposure to the martial arts was watching movies growing up. I ran around the house with a fake ninja sword tucked into my shirt and ninja mask on … or I was the Karate Kid. But in those days martial arts were magic to me, something only people in movies or who were fortunate enough to live next to Mr. Miyagi could ever actually do. When I was 12 years old I met my future brother in-law, Gary Berna, who was an amazing martial artist with a background in Hwa Rang Do and Kenpo Karate. Gary would show me a technique or a jump spinning kick and I can’t express how awesome it was to me at the time; I was hooked. When I was 14 years old, with Gary’s help, my mother signed me up for lessons at J.R. Diaz’s Kenpo Karate School in Lemoore, Ca. At that time I would get to the school as early as I could after school and I would practice on the back of the mat for hours. There was an awesome group of young martial artists ahead of me and I wanted to move like them, do Kenpo as well as them, and fight as tough as they did; put simply I wanted to be one of them and that was my goal. I received my green belt under Sifu Diaz, but due to an unstable home life I stopped studying karate in my late teen years. I remember one of the instructors telling me that the secret to being a martial artist was to stick with it, “stuff will get in the way but you can always come back,” and I have found this to be true. When I was 20 I found my way back to “The Karate School,” which was now run by Sifu David Calhoun. Once again I dedicated myself and spent the next 3 years refreshing and working toward my Black Belt, which I received from Mr. Calhoun on May 22, 2004. This was a transformative moment for me and that journey to black belt has helped shape the other successes in my life such as family, career and education. A year after receiving my black belt I graduated from California State University, Fresno, with a BA in Geography and went off to graduate school at California State University, Chico, where I received an MA. While at Fresno State I studied Shotokan Karate and Judo and later briefly studied boxing, kickboxing and Brazilian jiu jitsu. The journey of a martial artist is personal. For me Karate was and is necessary; I needed the discipline and self-confidence you gain when you constantly push yourself beyond what you think is achievable or comfortable, it has simply become part of who I am. I also need the mentors and family I’ve always found in the dojo. I use karate in my everyday life, when I have to tackle something challenging or intimidating, and when I’m not studying, I truly feel like something is missing. Today I am able to share my journey with my wife and kids. Our goal with Grass Valley Kenpo Family Karate is to share what we’ve been lucky enough to experience with the next generation of students here in Grass Valley and in doing so I hope to continue to learn and grow in the art. June 9-11, 2017, hand-picked by Mr. Planas to be an instructor at the first ever “Huk Planas World Gathering Kenpo Camp” in Las Vegas, Nevada. This camp had over 200 participants from more than 9 countries. I use Kenpo every day of my life. 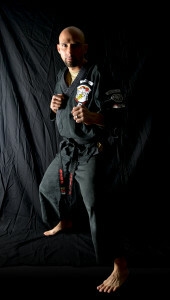 I currently hold a 4th degree black belt in Kenpo under Senior Master of the Arts, Richard ‘Huk’ Planas. I began my study of the martial arts when I was 15 years of age, just going on 16. I was never really proficient in any sports or activities up until that time, was extremely shy, and had very low self esteem. While attending high school I met a couple of gals that had been studying the martial arts. They encouraged me to check out The Karate School, in our hometown. The very first time I walked into the school, it was to watch one of my friends test for her blue belt. I was amazed. The basics seemed so difficult and the forms were so beautiful; I thought they looked like dancing. The sparring, which happened at the end of the test, was grueling. After the test, the black belt running it, Sifu J.R. Diaz, walked up to me, grinning. His first words to me were, “How did you like it,” and “when do you start?”. I was hooked ever since. I was a complete dojo rat those first few years. I was there everyday after high school to study Kenpo. I stayed from the moment the dojo opened until the hour it closed. I even took my homework with me so I could rush to get it done and get on the mat. I was obsessed. It was the greatest time in my life. 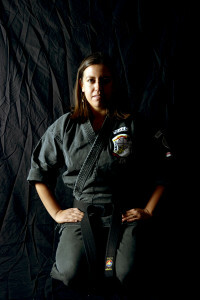 I eventually tested for my black belt on October 13th, 2001. But my study didn’t stop there. I still participated in all of the aspects of Kenpo. I taught and was taught. When you become a black belt, you can then really and truly become a student of the art. I soon went to college, still studying Kenpo, and dabbled in the other martial arts out there. I studied kickboxing, judo, and tae kwon do. But I had and still have a soft spot in my heart for Kenpo. I eventually graduated from California State University, Fresno, with a Bachelor’s in Business. After getting married and moving to Grass Valley, California, my husband and I were itching to find a Kenpo school to work out at. Not finding a school dedicated specifically to the study of Kenpo, we decided to start our own school. I now have a place to continue my studies and teach the art that I love – Kenpo Karate! SMA Richard ‘Huk’ Planas. Mr. Planas began his Kenpo training in Fresno, California in the late sixties under Steve Labounty and Tom Kelly. He moved to Texas to help Tom Kelly open a school in El Paso in 1969 and then moved to Pasadena, California, to go to work for Ed Parker as a Brown Belt. He received his Black Belt and all subsequent rank through Ed Parker up to Seventh Degree; the highest non-honorary, non-political rank given by Parker in 1985. 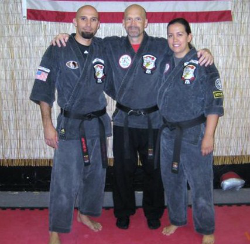 He became the Manager of the Pasadena school for several years, as well as the Executive Vice President of the International Kenpo Karate Association for the last ten years Ed Parker lived. Throughout this time, Mr. Planas was also instrumental in the development of the original manuals. After Parker’s passing other associations were formed, one of which promoted Mr. Planas to Eighth Degree in 1991. Then in 1995 several associations joined together to promote him to Ninth Degree Black. Though his expertise is mainly in Kenpo he has studied many other arts, including; Judo, Tai Chi, Kung Fu, Shotokan, and Silat. Mr. Planas is the Garcias’ instructor. He was David and Jakki’s instructor for 20 years. View some of our amazing students’ and parents’ testimonials HERE!